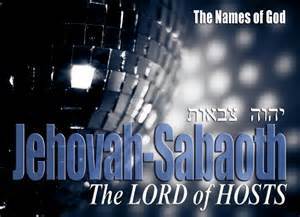 The phrase 'Jehovah Sabaoth' which means 'Lord of Hosts' is used well over 270 times in the Word of God. 'Host' is defined as a great number of something or an army. The phrase 'Lord of Hosts' implies the idea of great power. God has dominion over all of creation and that includes the angels, humans, stars, the sun, the moon, the animals and even Satan and his imps. We read in 1 Samuel 17:8-11 NLT how Goliath taunted the Israelites. "8 Goliath stood and shouted a taunt across to the Israelites. 'Why are you all coming out to fight?' he called. 'I am the Philistine champion, but you are only the servants of Saul. Choose one man to come down here and fight me! 9 If he kills me, then we will be your slaves. But if I kill him, you will be our slaves! 10 I defy the armies of Israel today! Send me a man who will fight me!' 11 When Saul and the Israelites heard this, they were terrified and deeply shaken." All of Saul's army was in fear of ONE giant of a man. Does that make sense to you? How can an entire army be afraid of one man, no matter his size? I'll tell you how...because they were allowing themselves to be deceived by the devil. Because Goliath looked big, the enemy let the imaginations of the army run wild and the warriors began to believe 'big equals better.' These were God's people. They were supposed to rely on HIM and not themselves or anyone or anything else! Then in 1 Samuel 17:45 NKJV, we find a young [probably around 12-13 years old] David boldly proclaiming to Goliath and all those around him, "45 You come to me with a sword, with a spear, and with a javelin. But I come to you in the name of the Lord of hosts, the God of the armies of Israel, whom you have defied." David was trusting not in himself but in the assurance that God was with him and He would be victorious because of GOD. We all have giants in our life. Those giants can cause us to fear and tremble...BUT...we need to remember 'Jehovah Sabaoth, the Lord of Hosts' is with us...He has our back. There is NOTHING the enemy can do to us that can change that fact! Goliath came before the army of Israel with a sword, with a spear, and with a javelin. David came before Goliath with GOD. The use of weapons require ME to do the work of battle, but in God, it's not me, it's HIM! No weapons are needed!! What is the worst case scenario concerning your giant? If what you are afraid will happen does happen, what is the worst thing that could happen? The answer to that is "With God, there is NO worst case scenario!" There is nothing your giant can do to you that God can't handle! When facing a giant in your life, remember this, you are too blessed to be distressed! Face your giants with boldness the way David came before Goliath. The world said David was crazy...but God...God intervened and David was victorious in His Name!! Have a 'giant defeated' day!!! "What is the worst case scenario concerning your giant? If what you are afraid will happen does happen, what is the worst thing that could happen? The answer to that is "With God, there is NO worst case scenario!" There is nothing your giant can do to you that God can't handle!" LOVE this!